Please comment to share your tandem schedules. These schedules show how you juggled two children at the same time (there is a separate post for 3 or more). Share the age of each child and your daily flow. As you add these schedules, I will add them to the main body of the post. 3pm run errands, go for walk, etc. Big girl 21months and baby 3monts. 16h baby wakes up nurse while big girl plays with trays, then sibling playing time. 18.30-19 dinner time and possible nap for baby (she’s loosing this one)if baby don’t sleep dinner time all together. 4pm go out, swim, parks etc. 6yo boy, 3.5yo girl, 18month boy. 7.45ish: dinner cleanup finished, mom & dad FREE TIME!!!! Outings/socialising are normally between 9-11.30ish. Errands are generally run after school between 4pm – 5pm. I try to have at least 3 ‘home days’ per week. Almost 4 year old girl (E) & 15 month old girl (M) – this is our summer schedule. Things will change in September when DD1 goes back to preschool three mornings a week and in October I will need to post in the 3 or more children thread because we are expecting a little boy at the end of October. This is our goal, but with DD1 in the weaning process to no nap and DD2 also weaning to 1 nap we often have to improvise. On no nap days for DD1, bedtime is earlier 6/6:30. As for playdates, we will do them in the am if they are our house. In that case, E has IP after her nap. For the most part out of the house activities are done in the afternoon after M wakes from her nap. 7:30 – (R)wake, dress, bottle (B) plays in nursery. Schedule for 3 year old and 1 year old. 9:00 start independent playtimes, boy in crib for 40 min, girl in room for 50 min. 10:00 errands/Bible study (for mom at church)/play dates/walks, etc. I am excited for this post as well, but I was wondering for those of you with one kid taking at least one nap while the older sibling is awake-what do you do with the older sibling while getting the younger one ready for a nap. The schedules just say, younger child nap, even Val's tandem schedule just says naptime but what is older child doing while you set the scene so to speak?I don't rock my 1 month old to sleep, I learned my lesson with the first one, but I do try to set the environment for quiet and I do sing songs etc. My 2 year old tries to be a part of this but is always too loud, opens and shuts closet doors, turns lights on, forgets to whisper-cries because he wants to give baby sister another hug or kiss…Right now I have books in the 1 month old's room and try to have 2 year old read quietly, but he will get up and leave and close the door loudly or something.For one of the naps he is taking his nap, but she is still taking 4 naps during the day- I need something else for him to do during those other times-right now, understandably, he just wants to be with mom as much as he can, I can have him do IP for one of the naps, but I simply feel I can't just 'make' him leave my alone for the others…Val you said you rather Brayden doing IP while you nursed Kaitlyn, but then what did he do when you were putting her down? At one month old, my girls were both awake for less than one hour. So when Kaitlyn was a baby, I think Brayden was watching a show when I was putting Kaitlyn down for the first nap. For nap two, he was in independent play still. For nap three, he was down for his nap. For nap four, DH was home.When McKenna was a baby, Brayden was just required to be out of the room when I was putting her down. He was almost four and that was okay. But even so, for one nap he was in independent play and for another he was in his own nap. With Kaitlyn, I just had her also in indpendent play for one, nap for another, DH home for the last, and for the first, she and Brayden played.For my kids at two, I would feel fine telling them they couldn't be in the room if they talked at all or were noisy…which is pretty much a given for a two year old. Thank you, everyone, for posting your tandem schedules. 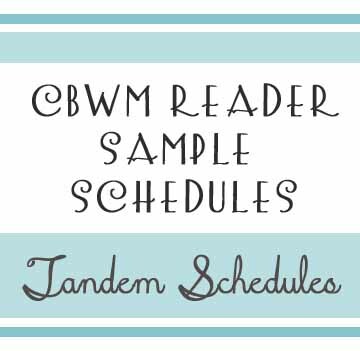 I have added your schedules to the post and will now delete your comments.Readers are still welcome to add tandem schedules.